By Jake Rocheleau in Coding. Updated on November 8, 2018 . In the first part of our iOS tutorial I took you through a guided tour of the iPhone app development. 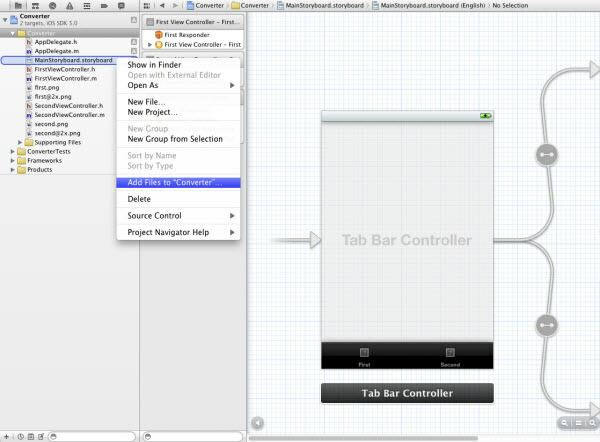 We got a deeper look at Xcode 4, and also took a very short tutorial on building iPhone app. The beginner tutorial was written for anyone who is looking to get into programming iOS apps. Today, we’ll get into the second segment of the topic, where we will be building a fully-functioning iPhone application. The app, with a tabbed navigation, will convert temperature units and distance units. Don’t worry if you’re still new to the Xcode. It does not take very long time to comfortably adapt into the interface. I’ll be explaining each step in detail so you shouldn’t get lost, either! At the end of the tutorial you will get an application which can’t be pushed into the iPhone since it will need you to purchase developer program, but we can run it inside the iOS Simulator on a Mac OS X system. I’ve offered the project files for download which you can also refer when you are not sure about certain step. So you want an app, let’s get started! Note: You will need a computer with Macintosh Operating System (Mac OS) for Xcode installation, application development and app submission, there’s no way you can do it on Windows legally. If you haven’t done so already you will need to get Xcode 4 on your computer. 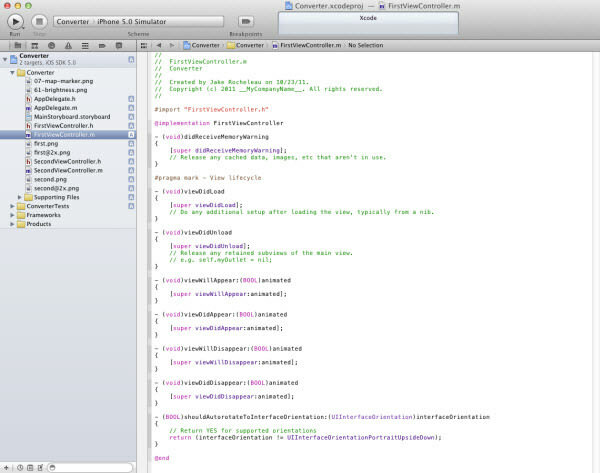 You must use Xcode 4 since this tutorial is written specifically for Xcode 4. If you’re running the latest Mac OS X Lion a simple search in the App Store can get everything you’ll need. 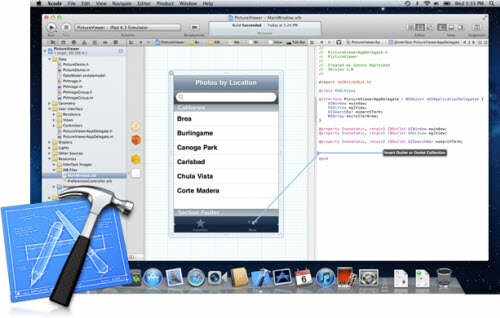 Xcode 4 includes the iOS SDK & Simulator for building and running iPhone apps directly on your Mac! If you cannot find the Xcode 4 in App Store, you can also try to access official Xcode page to download the software. Otherwise you’ll need to find the software in your developer account, which you can register without fee in the Apple Developer site. You could also check on Google if you’re having a difficult time finding the software. Apple tries to keep their developers more privatized and refined, so it can be a struggle getting everything setup to begin programming. Luckily Xcode is a one-time install that includes all the SDK stuff you’ll need for iPhone app development. After the installation is completed, pop open your new software and let’s build this iPhone app! Open Xcode 4 and you should get a startup screen with a few default options. 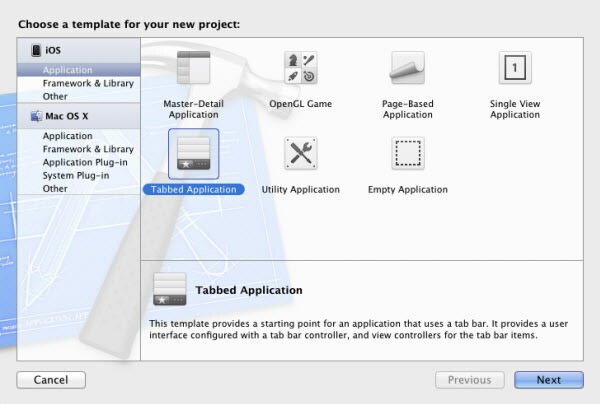 From the list select “Create a new Xcode project” to open up the main window. Here you’re given a choice to select which new template to begin with. We’re going to use the Tabbed Application. Hit “Next” and you’ve got to enter a name for your project. I’ve chosen Converter. You then need to enter the Company Identifier, such as com.hongkiat, which is used to sort the internal build directories of your application. Make sure you select “iPhone” from the Device Family, and all options below are checked. Hit next and select a location to create all the project files. In the left pane you’ll notice the Project Navigator with a whole new set of files. Click on the “Converter” file to view all files inside. Beside the Project Navigator is called Document Outline. Remember these names since we’re going to use them throughout the entire tutorial. 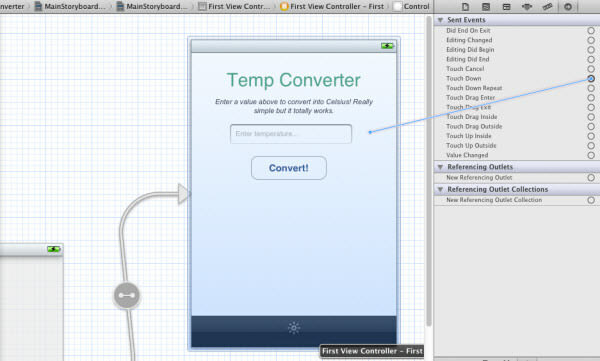 You should notice 3 very important files: MainStoryboard.storyboard, FirstViewController.h and FirstViewController.m. The .h and .m files are used for header and implementation code which basically connects the back-end programming with our front-end buttons and text fields. You should see matching files, SecondViewController.h and SecondViewController.m for Second View as well. 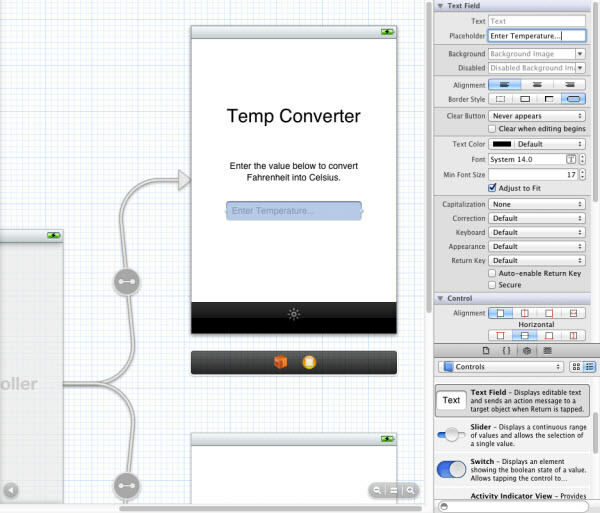 The storyboard file was originally a .xib (pronounced nib) file which was ported over from Interface Builder. 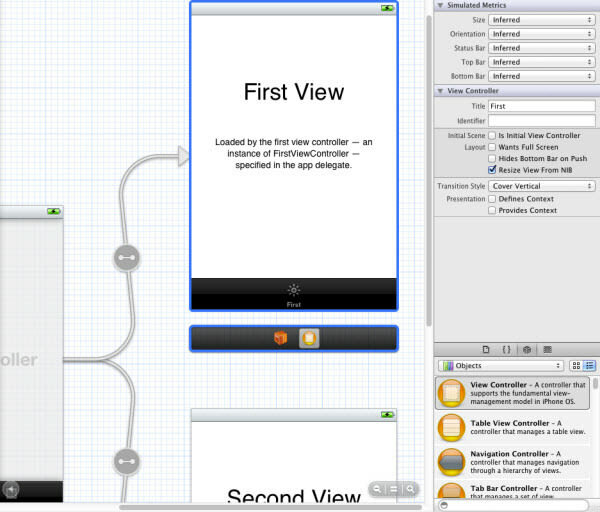 The newest release of Xcode 4.2 actually ties this functionality into a type of flowchart to make editing a bit easier. 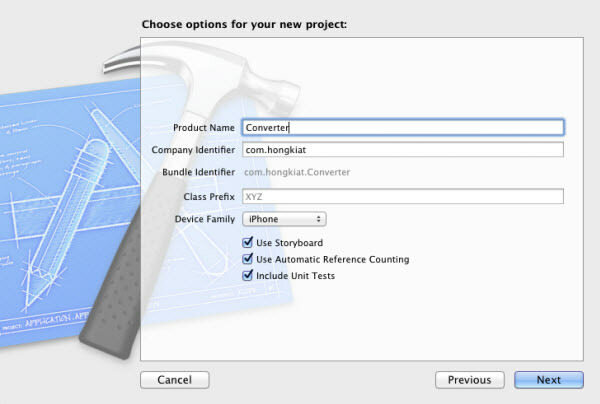 When creating a new project you can un-check the storyboard option and you’ll have individual .xib files for each view. If you feel more comfortable in the old file system you can use that, but for this tutorial you must stick to the storyboard method. 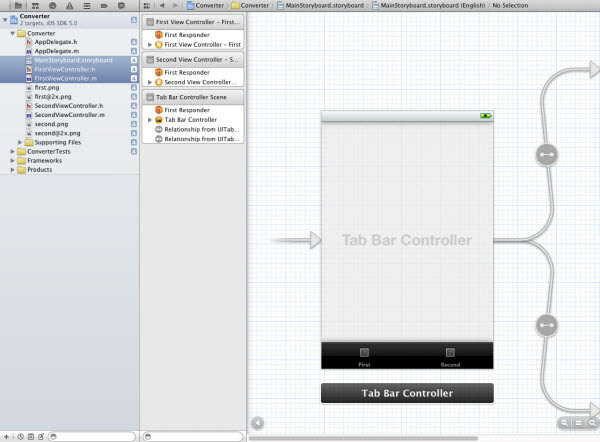 We will start building the interface components first and move onto Objective-C programming later. To begin let’s replace the label text with icons in the tab bar. First of all, head over and download the Glyphish icon set to the Desktop. They offer a pro set with 2X icons for iPhone 4 retina display – but we can work with the free standard icons for this tutorial. Back in Xcode, in your Project Navigator, right click on the first yellow folder which contains your main views and select “Add files to Group…”. The Group should be titled according to your project name, for this case it’s Converter. A new window will open to select files to add into Xcode. 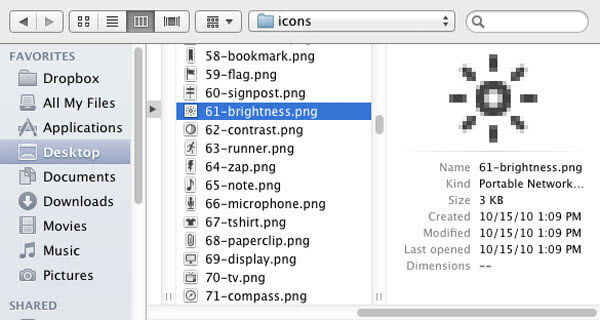 Choose the Glyphish Icon’s file located on the Desktop (or anywhere you saved it to) and inside the icons file, choose the 61-brightness.png. Click “Add” so they’ll be imported into your project directory. Repeat the same process to add 07-map-marker.png into the project directory. Now, select the MainStoryboard.storyboard to open the visual editor in the center of the software. To the left you’ll notice a new menu existed on the right side of the Project Navigator, called the Document Outline. This is a documented list of all the elements, pages, views, and navigation in your app. Before we add the icons we also just need one other menu called the Utilities. The Utilities pane is enabled by default, but you can also enable the Utilities by select View > Utilities > Show Utilities on the top menu bar of the software. Back in the Document Outline you will notice how the First View and Second View each have their scene box and view controller. Click on the left arrow of First View Controller – First to display more elements and you should spot Tab Bar Item. Click to select it, and if you can’t see anything try scrolling over to the right in your storyboard viewer. All the edits for the tabs will be done in the Attributes Inspector, which you can show it by select View > Utilities > Show Attributes Inspector. Now look at the Utilities pane on the right side of the editor, and you will see the Title and Image property under the Tab Bar Item. Click on the down arrow of the Image option, then select 61-brightness.png, the icon will be assigned to the Tab Bar Item of the First View. You can also remove the Title of the Tab Bar Item so there will be no text below the icon. For the Second View, you can return to the Document Outline and click on the down arrow of Second View Controller – Second to show the Tab Bar Item – Second. Click on the “Tab Bar Item – Second” and look at the Utilities pane on the right side of the editor for the Title and Image property under the Tab Bar Item. Click on the down arrow of the Image option, then select 07-map-marker.png, the icon will be assigned to the Tab Bar Item of the Second View. Remove the Title of the Tab Bar Item. We’ve finished importing and setting the images, now let’s get into designing the views. Basically we will design the First View, then copy all elements from the First View and paste them into the Second View, with some extra changes for the Second View later. For each default view we are given a basic text header and description object. Double-click on the “First View” text of the First View Controller in the visual editor and change it to “Temp Converter”. 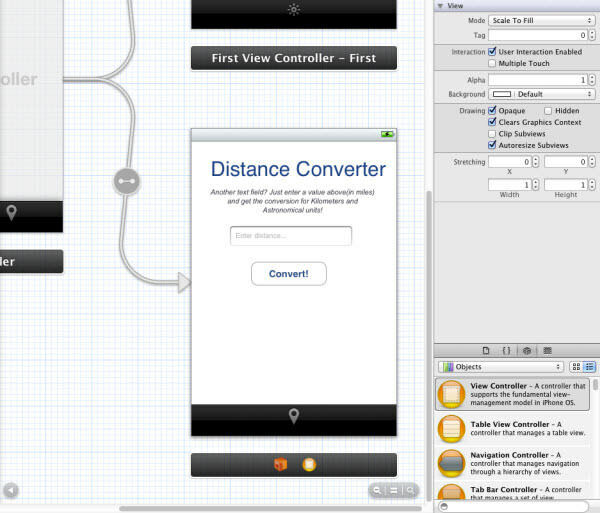 Repeat the process for the Second View Controller but change the name to “Distance Converter”. You can select the text and move onto your Attributes Inspector in the Utilities pane to change the font, color, size, etc. Now we need to create a text field for the value input. In the bottom part of Utilities pane located at the right side of the software, you should see the Objects library, which can also be enabled by select View > Utilities > Show Object Library. In its drop-down menu choose Controls and select a Text Field, then drag it into the First View Controller. Move around the text field to center it and click to resize the box to the size you prefer. If you look over to our Attributes inspector in the Utilities pane you can also change the text color of the input field. 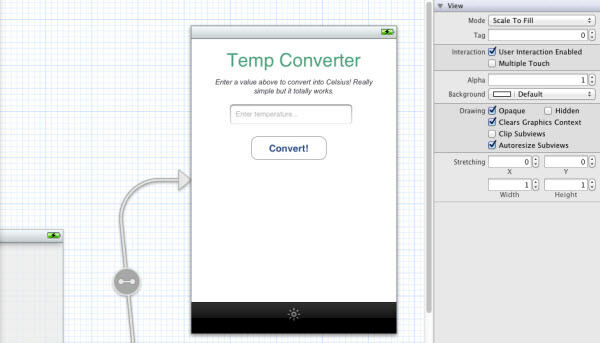 Next, add the text, “Enter temperature…”, into the Placeholder field (not the Text field). Now let’s do some extra settings to make the app a bit more user-friendly. Look into the Utilities pane until you find the property, Clear Button, then change from “Never appears” to “Appears while editing”. This allows you to delete the entire entry at once without tapping x button for several times. Next, look into the pane again until you find the Keyboard property with a drop-down menu. I’ve changed this from “Default” to “Number Pad” so the input will be limited to only integers. Next we’re going to create a button so we can click it to convert the value. Drag a Round Rect Button from the Object Library located at the bottom of the Utilities pane, and place it below the text field. Double-click to add the text “Convert!”. Again spend some time in the Attributes inspector to spice up the style a bit, although it looks fine by default. We just need to drag the Label object from the Object Library into the First View Controller to handle output text from the conversions. When you drag the label into the view, by default it’s given some static text, such as “Label”. You should delete the text so nothing will be displaying when the app launches. Resize the box to make it wider and position it below the Convert button. 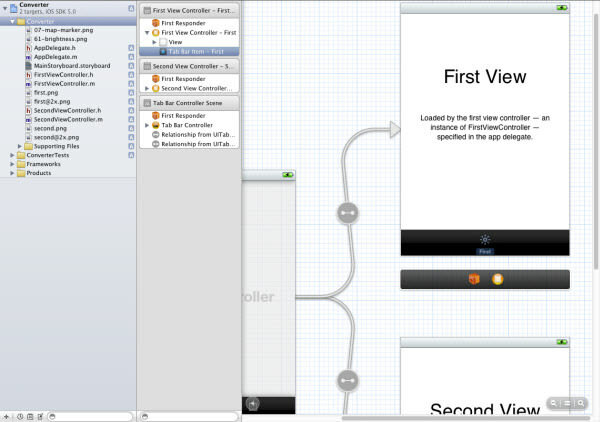 Before we move to the Second View Controller, you can improve the design of the First View Controller. It’s recommended to improve the design now so later when we duplicate the elements of the First View Controller to the Second View Controller, we don’t need to re-design the Second View Controller again. Now let’s do the same process for the Second View controller. We can save time by copying everything from the First View, but we also need to change certain things to match the function of the Second View Controller. Text Header – Change to “Distance Converter”. Text Field – Placeholder reads “Enter distance…” and set Keyboard property to “Number Pad”. Labels – Add 1 more Label below the existing Label. The top Label will display Kilometers value, while the bottom Label will display Astronomical Units value. This is what you will achieve in the end, you can notice that the outcome of the Second View is almost identical to the First View. Enough graphics for now, let’s move into some programming! We can start off building the backend functionality for our simpler first view. 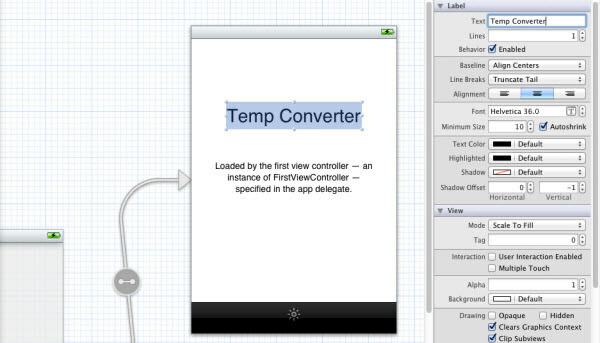 Select FirstViewController.h from your Project navigator. Now replace the code above with the code below. 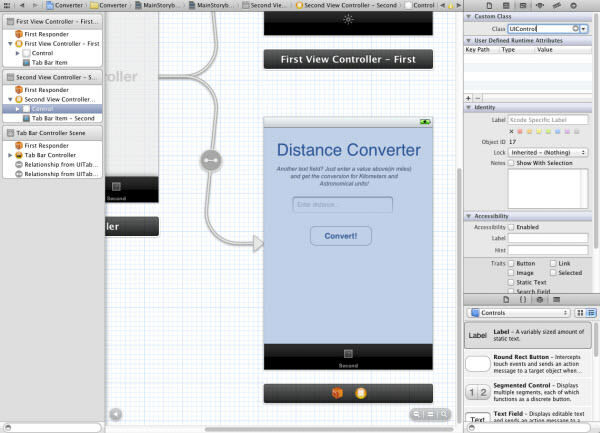 The @interface keyword is creating a subclass of UIViewController, which is the default view in any iOS app. 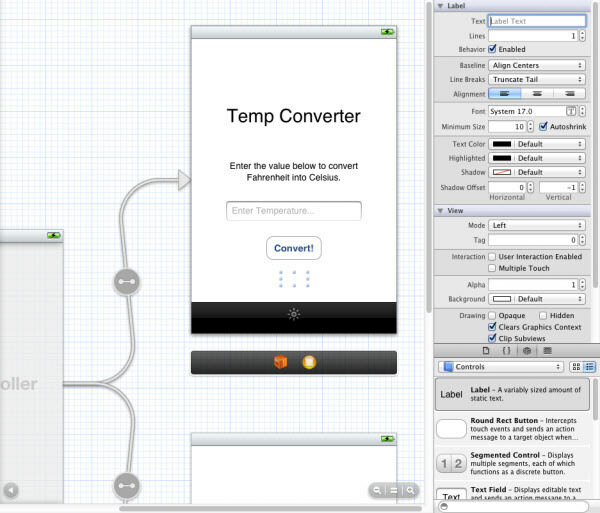 We need to declare IBOutlets (Interface Builder Outlets) for each of the elements in our app. 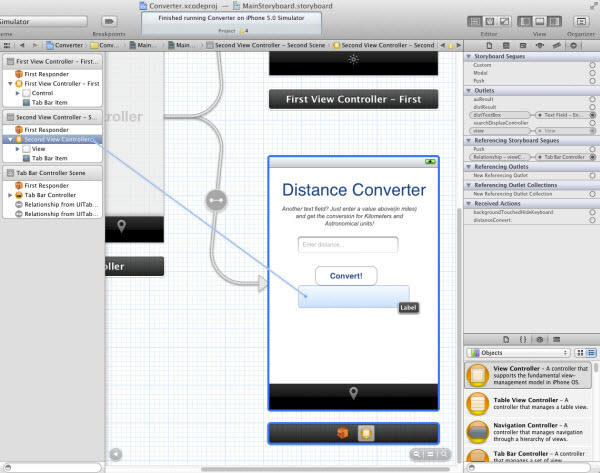 This is what @property is creating – a new outlet for Xcode to connect into the interface. I also defined two actions which in layman’s terms are blocks of code to execute whenever they’re called. 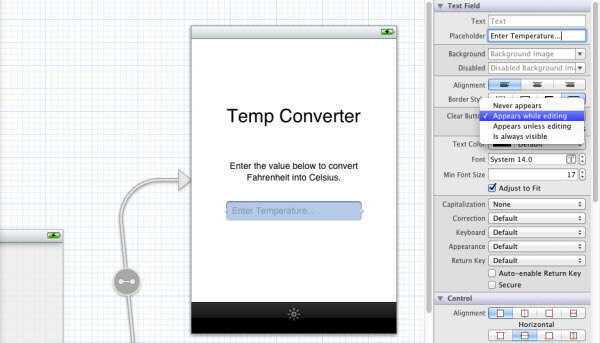 About degreeConvert, it will take the value in our text field and perform conversions from Fahrenheit to Celsius. Similarly backgroundTouchedHideKeyboard is a small action I’ll be adding to hide the keyboard when the user touches any part of the background. Now we get into the differences from .h and .m files. We’ve declared all of these functions and variables, but they don’t do anything or connect into anything right now. We need to implement the functionality into our FirstViewController.m. 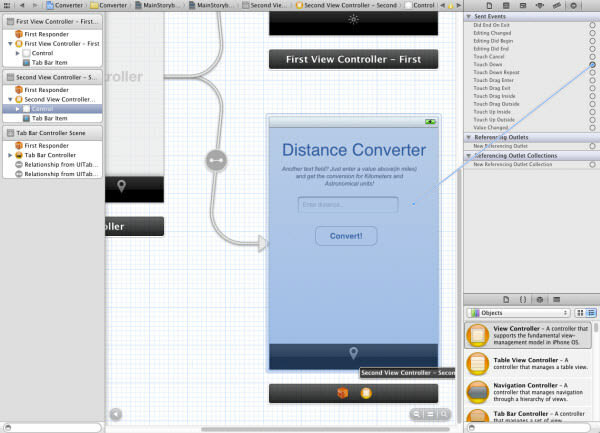 Save any changes and click to open the FirstViewController.m in Project Navigator. We need to create a synthesis accessing elements in the First View header. This is performed with @synthesize so now our actions can manipulate the different objects on-screen. This is declared on the single text field and results label, respectively. To go further let’s look at the two functions I’ve pre-written. If you are still new to Objective-C syntax then it may seem a bit funky. But you’ll get used to the structures over time, paste the code below into the file. First we have degreeConvert which takes in no parameters and returns void. This is the method called when a user presses down on the convert button in first view. A variable fahren is set to pull the value from whatever the user has entered. We can then calculate another variable celsius with basic math. Now [tempTextBox resignFirstResponder] is actually calling a method resignFirstResponder on our keyboard. This code is also seen in the second function backgroundTouchedHideKeyboard. Basically it hides the keyboard and deselects the text field after the user either touches the background or hits the convert button. The rest of our degreeConvert function creates a new string (NSString) to store the Celsius conversion and using dot syntax adds this into our label field. If you have any familiarity with C-based programming (Java, PHP, C#/C++, Perl) some of these terms should be familiar. At the bottom of our FirstViewController.m I’ve done some garbage collection for the variables we synthesized. We should release all the different subviews from memory which include our text field and output label. Automatic Reference Counting (ARC) will automatically deallocate variables from memory which will save so much stress on iOS projects. This is the final step for the First View and we will connect our front-end elements with back-end code! When building iOS apps there are 3 major segments to completion: adding the physical UI elements, writing the program code, and finally connecting the two together. This segment will wire all our First View’s components up to make it run and work perfectly! Save both your FirstViewController.h and FirstViewController.m to make sure everything is updated. Then, click back onto the storyboard and look at the Document Outline. In there you’ll notice an orange orb which should be named First View Controller – First. Click on the orb to select it, and a blue outline should appear on your First View scene. Now press Ctrl and click the First View Controller – First to drag onto the text field, then release it. After the action, a list of Outlets will come up. Select “tempTextBox” from the list. If the connection is successful the text field will flash. Now press Ctrl and click the First View Controller – First again to drag onto the Label field and select “calcResult”. Both our outlets are now connected into these variables and we just need to connect the actions. Click on the right arrow of the First View Controller – First and you will see a component named View – click to select it. Open your Identity inspector in the Utilities pane, which you can also enable it by move onto the top menu bar of the software, and select View > Utilities > Show Identity Inspector. Under Custom Class, enter “UIControl” or select it from the dropdown menu. In order for the keyboard to recognize the background as a tappable object it must be converted into a control. Now over in the Utilities pane activate the Connections inspector by move onto the top menu bar of the software and select View > Utilities > Show Connections Inspector. This is how we connect a page event (swipe, tap, hold, etc) to a single function call. Look through the list of events until you find Touch Down. Click in the small circle located at the right side of the Touch Down event, then drag and drop it onto the First View Controller. You’ll be given 2 actions to select from – choose backgroundTouchedHideKeyboard and you’ll get a confirmation flash. Finally click to select the Convert button and make sure it has a blue highlight, similar to the screenshot above but without selecting the whole View Control. In the Connections Inspector drag the Touch Up Inside’s small circle then drop it onto the First View Controller again. 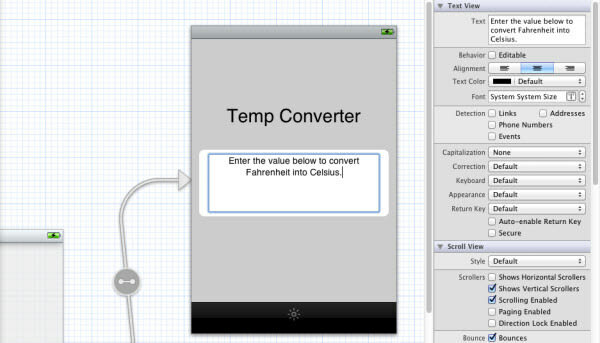 Choose the function named degreeConvert, which will only trigger when the user touches the button and releases within the set boundaries. Now this may be a good time to save your work and compile/build the application so far. If everything is running smoothly you should be able to enter some values into the text field and hit convert to see the result in Celsius! If you’re getting any errors try downloading demo project at the last section of this article to compare the differences and fix the errors. I’ll assume you’ve already created the layout for Second View in the earlier section. Instead of outputting 1 conversion (Fahrenheit > Celsius) our Second View will output 2 values (Miles > Kilometers and Miles > Astronomical Units). So all we need to do is migrate the Objective-C code from First View and reorganize everything to work properly for our Second View, then finish up by connecting the storyboard to our new actions and outlets. We should start with the header code and move into implementation. Below I’ve added the full code from my SecondViewController.h file. It’s basically a clone of the First View Controller’s header, but with an additional property linked to the second UILabel element. You can notice I’ve changed all the instance names for the actions and outlets. distTextBox will now hold our text input for distance. distResult is the 1st distance result label (kilometers) and auResult will hold our 2nd conversion label. distanceConvert is the new action we call to convert the numeric value, and backgroundTouchedHideKeyboard remains the same. As before we’re using the MVC hierarchy to break apart the app functions (implementation) from the controller between storyboard objects. If your SecondViewController.h is looking the same as mine above, save changes and select SecondViewController.m. I will again break up my code into two parts. The code below is from the top portion of my SecondViewController.m. This contains the @synthesize statement to create setters and getters for each instance variable. I know this concept of synthesizing instance variables can be very confusing initially. I recommend this StackOverflow thread which may help to clear things up. The new action distanceConvert will be called once the user taps the Convert button. Variable miles will pull the number from distTextBox while km and au perform some basic mathematical conversions to achieve their data. Afterwards using 2 lines we allocate memory for 2 NSString objects holding the Kilometer and AU output info. Using dot syntax we call upon the .text property to change UILabel text. And now the final bit of code found at the very end of SecondViewController.m. viewDidUnload is called after our view is finished compiling and displaying. We set the three properties synthesized earlier to nil (null in Objective-C) and release their instance from memory. 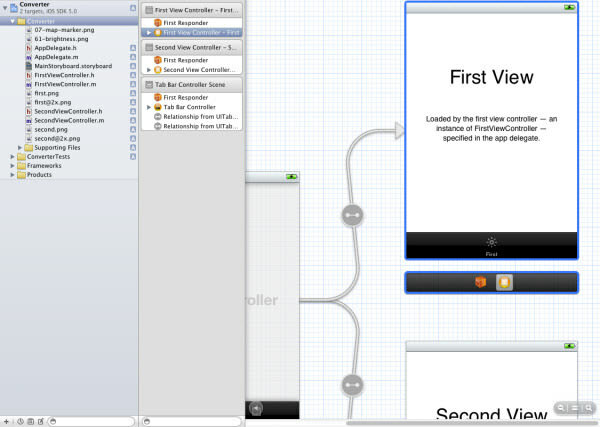 The app is almost complete after we finish connecting the storyboard to outlets and actions. The process of building views is basically a repetition of the step 5, with little extra steps. You can treat this as an exercise to strengthen your memory on connecting the storyboard to outlets and actions, as they can be very confusing in most times. Again, save both your SecondViewController.h and SecondViewController.m to make sure everything is updated. Then, click back onto the storyboard and look at the Document Outline. In there you’ll notice an orange orb which should be named Second View Controller – Second. Click on the orb to select it, and a blue outline should appear on your Second View scene. Now press Ctrl and click the Second View Controller – Second to drag onto the text field, then release it. After the action, a list of Outlets will come up. Select “distTextBox” from the list. If the connection is successful the text field will flash. Now press Ctrl and click the Second View Controller – Second again to drag onto the Label field and select “distResult”. Repeat the process again for the 2nd Label located below the 1st Label, but choose the “auResult” for it. Both our outlets are now connected into these variables and we just need to connect the actions. Click on the right arrow of the Second View Controller – Second and you will see a component named View – click to select it. Open your Identity inspector in the Utilities pane, which you can also enable it by move onto the top menu bar of the software, and select View > Utilities > Show Identity Inspector. Under Custom Class, enter “UIControl” or select it from the dropdown menu. This is how we connect a page event (swipe, tap, hold, etc) to a single function call. Look through the list of events until you find Touch Down. Click in the small circle located at the right side of the Touch Down event, then drag and drop it onto the Second View Controller. You’ll be given 2 actions to select from – choose backgroundTouchedHideKeyboard and you’ll get a confirmation flash. Finally click to select the Convert button and make sure it has a blue highlight, similar to the screenshot above but without selecting the whole View Control. In the Connections Inspector drag the Touch Up Inside’s small circle then drop it onto the Second View Controller again. Choose the function named distanceConvert, which will only trigger when the user touches the button and releases within the set boundaries. Build and Run to see if your app succeeds in compiling. If there are no errors everything should work properly. You could now spend time sprucing up the text and layout, or maybe adding a custom logo PNG. 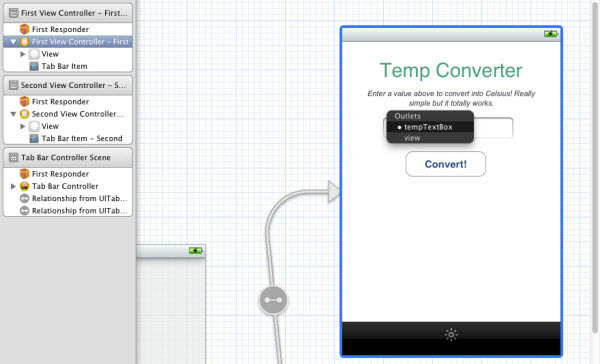 Thanks for following the tutorial and congrats, you’ve just made your first working iPhone app! Can’t achieve certain step? Here is the result’s file for you to test and compare the difference. In closing it would be helpful to do an overview of the key points in this tutorial. 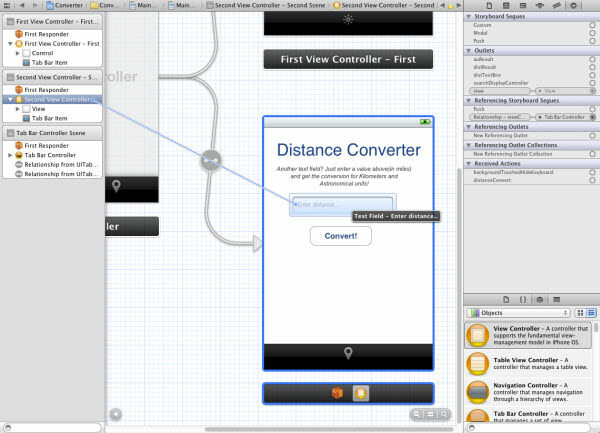 We started a new Xcode iPhone app project with a tabbed navigation. This includes 2 UIViews which we added a text field, button, and labels. We then wrote some Objective-C code for defining Instance Variables (ivars) and Actions (functions) to crunch the numbers for the conversions. After all these, we finally connected Objects for each Instance Variable. 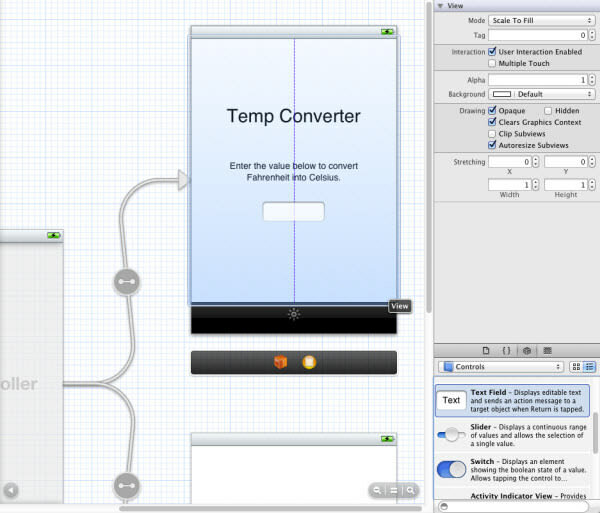 This allows the Objective-C backend implementation code to target an ID such as tempTextBox and tie it into a storyboard object. Hopefully you’ve digested many of the keywords and techniques for using Xcode. 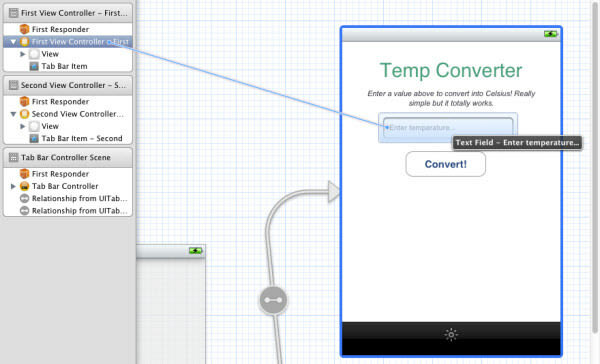 You most likely won’t be an expert at building iOS apps after this tutorial. In fact you may still be deeply confused on a lot of these topics! iOS programming is about practice, so don’t feel sad if you cannot understand everything right away. Try downloading the demo project file I’ve provided and look through to familiarize yourself with this tutorial, and Xcode projects in general. One last tip: never give up!